An Israeli archaeologist says he has found the tomb of King Herod, the ruler of Judea while it was under Roman administration in the first century BC. After a search of more than 30 years, Ehud Netzer of the Hebrew University says he has located the tomb at Herodium, a site south of Jerusalem. Herod was noted in the New Testament for his Massacre of the Innocents. Told of Jesus' birth, Herod ordered all boys under two in Bethlehem to be killed, the Gospel of Matthew said. According to the New Testament, Joseph was warned of the threat in a dream and fled with his wife and the child to Egypt. "When I realised it was the tomb there was great happiness," said Prof Netzer, who has worked at the Herodium site since 1972. "Everyone has an interest in the Holy Land and Herod's tomb is part of that story." It was an ancient staircase built for Herod's funeral procession - described in detail by First Century historian Josephus Flavius - that led Prof Netzer's team to the hill-top burial site. "The monumental stairs were built specifically for the funeral," Prof Netzer said. At the site, archaeologists found a smashed limestone sarcophagus that, when whole, would have been around 2.5m (8ft) long. Ornate rosette decorations on the fragments alerted the team to the coffin's significance. No bones were found at the site. Prof Netzer said that they had likely been removed by Jewish rebels who fought against Rome between 66 and 72 AD. The site at Herodium is in the West Bank, occupied by Israel since 1967. Palestinians officials have in the past complained about what they see as the theft and commercial exploitation of their artefacts. If the find is confirmed, this will rank as a major archaeological discovery, BBC Jerusalem correspondent Tim Franks says. 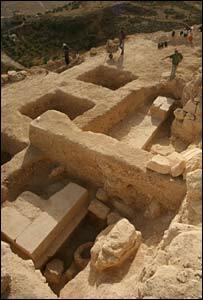 Experts have always believed that Herod was buried somewhere within the palace complex he had constructed on a flattened hilltop in the Judean desert, but they had repeatedly struggled to find any evidence to back up their theories. 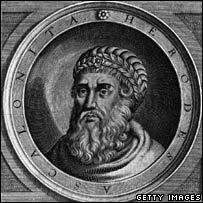 Herod was appointed "King of the Jews" by the Roman authorities and ruled Judea from 37 BC until his death in around 4 BC. He is known for his expansion of the Second Jewish Temple and the construction of walls around the Old City of Jerusalem. He also built the fortress of Masada, which became the last stand of Jewish rebels in 73 AD.